On any given day, my five-year-old son’s bedroom is littered with dinosaur toys. The route from his bedroom door to his bed is a gauntlet of (amongst other toys) small plastic dinosaurs. Needless to say, he is fascinated by these massive, prehistoric lizards, and I knew that he would thoroughly enjoy iDinosaur. iDinosaur is more than a book. It’s an Augmented Reality experience that merges old-school story-telling with modern technology. By simply downloading a free app, readers can use their smartphone or tablet to bring the pages to life, each unleashing a roaring, walking or flying CGI dinosaur. Readers can also interact and take photos with the onscreen reptiles, much to any youngster’s delight. The comprehensive 32-pager is one to enjoy over a few sittings with your young child (if they can’t read). If your child is a little older and can read, they can engross themselves in the book and its app at their leisure. Written by Dr Darren Naish, it is packed with fascinating facts and tidbits, perfect for any dinosaur buff – young or old. It is also a great research tool for any dinosaur-themed school project that might come up. The visuals throughout the book are bold and striking. Certain elements – like the bright yellow warning sign-inspired titles - even got my heart racing a little. It’s a new an exhilarating experience for kids and adults alike, and definitely didn’t disappoint my budding paleontologist. 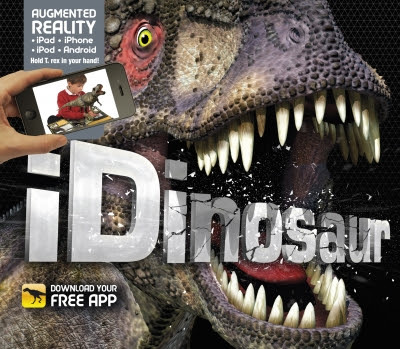 iDinosaur is supported by a free app download, available for iPhone, iPad, iPod touch (all running iOS 4.3 and higher), as well as Android phones and tablets.